For a few seconds, everyone froze into a strange tableau; the old hilltribe woman, wrinkled and bent, perhaps her grandson with his son, passers-by and lingerers, the Laos government official who had just told us that the rules had changed and that she didn't need to clear us to leave the town, the jumbo driver with his confident air and smart reflective shades, and us. It was one of those moments when the modern world collided with the traditional world: perhaps a moment when, at the grassroots, something shifted for ever for those dozen or more people in the old royal city of Luang Prabang in central Laos. The incident began with me photographing the woman, squatting by the pavement selling small bags of firewood, embroidered squares and some crude metal bracelets. In return, she wanted a sale. She held up two fingers for 2,000 kips for a bracelet, no doubt expecting to sell for 1,000. The driver of our jumbo said something that astounded her and then turned to us and said the price was 10,000 kips. Every head turned. Everyone froze. Would we pay that much? Oh, sure, why not? She needed it. We didn't. I handed over the money and took the bracelet. She was stunned. Everyone gawped. All over £1.50. And it was suddenly clear what an amazing ride many Lao and hilltribe people are going to have as Western commerce, tourism and media take off in the emerging Divine Kingdom. You do not get that kind of experience in Vientiane, the capital, where 10,000 kips would be enough for a jumbo driver to grab your arm off. But we were travelling through Laos from the west, an unusual way into the country at the moment, and people have not had time to catch up with the ways and opportunities of the falangs. We flew up to Chiang Rai in northern Thailand from Bangkok and took a bus to the frontier town of Chiang Khong, where we bought our visas through an intermediary for $60 each. 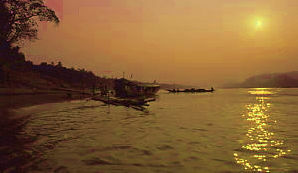 The next morning, a light mist over the Mekong, our ferry edged across to Huay Xai with us and half a dozen backpackers. We went through the formalities, exchanged £100 for a huge wad of 660,000 kips, and got a jumbo to where the fast boats were moored. After a quick and friendly haggle over the fare, the jumbo driver pointed us towards a square, brick building near the edge of a steep, 50ft bank to the Mekong. The fast boats can carry six or more passengers and the fare is calculated on that kind of packing, which is okay for the smaller Lao people but very uncomfortable for larger Europeans. Anyway, we had linked up with a Dutch couple in Chiang Khong with the intention of hiring a whole boat for the four of us. Eventually, we agreed a price of about £100 for the boat, got out papers signed by the internal immigration officer and scrambled down the bank to where the boats were moored. First, the 'driver' insisted on safety equipment. Crash helmets, two of which fastened, and lifejackets, three of which fitted. They don't take it too seriously: locals do not bother but falangs, by law after a Thai was killed, have to wear the kit. Our 'driver' packed our bags, clambered over to the stern of the boat  a very sleek, stylish craft, not much bigger than a rowing boat, with a 1300cc car engine bolted to the back and a 15ft propeller shaft projecting into the river. He started the engine, manoeuvred round, aimed the thin prow at the vanishing river to the east and opened the throttle. We rocketed off along the Mekong in the direction of Luang Prabang, the brightly-painted boat hitting 50mph in seconds. We could have gone down the Mekong in a slow boat. It takes three leisurely days to cover the 300 miles to the world heritage town. But women are not allowed on the cool roof lest they confuse the senses of Buddhist men and that takes the edge off the experience. So we did it in six hours, plus one for a pitstop, swerving round unseen, underwater obstacles marked with old plastic bottles; roaring between rock outcrops; riding the tops of the waves, like going over cobblestones at 50mph without any suspension, in rapids and where other rivers joined the Mekong. And deafened by the open engine a few feet from our heads. Within minutes, the thrill of speed gave way to the interest of river life and the unfolding scenery, jagged hills fading blue to grey. At the pitstop, at Pakbeng half way between Huay Xai and Luang Prabang, the boat was tied against other boats and we climbed over them to reach an old wooden craft that now serves as ferry terminal and eating place. We clambered on board, adjusted our eyes to the gloom after the river's brightness and made our way across the crowded deck and bought what was going: noodle soup. It was love at first taste. A group of young local mums lounged at the back, watching us watching them as we ate; some of the Pakbeng boys were ostentatiously hanging out, definitely not watching the falangs; backpackers, Lao business men, families ... we all shared tables, milled around, eating and drinking great bottles of Beerlao. Then it was time to get on our way. The boat roared on until, thanks to the vagarious nature of the Mekong's course, we arrived at Luang Prabang as the sun set in front of us. We got as near as a fast boat gets to the town. From there, it was another 20 miles of dusty roads before we arrived, battered and dishevelled, at the best hotel in town, the Villa Santi, which was once owned by a princess and which usually takes well-groomed guests who arrive in a limousine from the airport. We looked like we had just belted down the Mekong at 50mph and then been blasted with dust for 20 miles. The receptionist looked shocked. Dusty backpackers tend to shun the Villa Santi. "Forty dollars," he said, totally baffled when I said: "OK." So baffled, in fact, that he gave us a room which, we learned the next day, was being held for someone else. Laos, like Thailand, is a Theravada Buddhist state: 60% of the population, probably 90% in towns, lives by the dhama; the rest are mostly rural hill tribe animists. Luang Prabang, the historic royal city, embodies that Buddhist spirit with its 32 wats  temple complexes  and hundreds of monks and novices. Perhaps, too, in the gentle people. Do good, receive good; do evil, receive evil. It works in a town that practises what Buddha taught. We emerged from the Villa Santi in the mild air of a February morning to explore its historic area between the confluence of the Mekong and Khan rivers. The temples date back to the 16th century but almost every one has been destroyed and rebuilt at some time as Laos' violent neighbours  especially the Siamese, Chinese, and Burmese have invaded and withdrawn. The exception, Xieng Thong, is the classic Luang Prabang wat, with its distinctive deeply-sloping roofs, its royal funeral chapel (housing an enormous funeral carriage holding royal ashes guarded by a dramatic naga, Buddha's seven-headed serpent so loved by Lao temple designers) and a unique reclining Buddha. We sat in the shade at Xieng Thong , looking at the chapels and chedis, the ripple of the blossom, and the slow and dignified passage of the monks. It was there, in Xieng Thong's tranquillity, that we met Sing Thong, a 16-year-old novice. He was waiting for someone who would help him with his English grammar and, lesson over, he showed us around the wat and told us about his life. Later, we went to his 6ft x 8ft room, which he shared with another novice, and drank tea while we talked. On the other side of town was Wat That Makmo, better known for its Water Melon Stupa. The temple houses a breathtaking collection of valuable and historical Buddha images. The shutters of our cameras clicked: were we paying our modern respects or collecting a little of the eternal peace of That Makmo? Maybe both. In the streets, casual everyday life was flowing around us. The fashionable game for the eight-to-14s was to throw their flipflops, one at a time, at 100 kip notes in the road  hitting it, meant winning it. At the bank, without bars or security screens, we sat and waited for our kips. A young woman, slight and perhaps 5ft tall, came in and spoke over the wooden counter to the cashiers. They began stacking bundles of notes on the counter. The pile grew into a block of kips 18 inches high, 12 inches wide and 18 inches long. The woman started scooping them into a black plastic rubbish bag, which was soon too heavy and she let it drop to the floor while she continued to fill it. When it was full, she tried to lift it. Not a hope. Then she tried to drag it. Not much better. June, my wife, got up and offered to help and between then they hauled it out, draped it over the basket on the front of her moped  and she wobbled away. Most people who visit Luang Prabang make the journey to the Pak Ou caves, with their 4,000 Buddha images. They travel the 25 miles by boat but we hired a jumbo. It was a hilariously bad ride that we wouldn't have missed and the trip included June earning her rice by taking up the good-natured challenge of the women road workers to help dig foundations. Back in Luang Prabang, food was a real problem  choosing which of the marvellous open-air restaurants to dine in. And working our way through the huge variety of dishes  a real luxury for us as vegetarians. Unesco, in its citation for Luang Prabang's elevation to world heritage site (with the consequent inflow of much needed restoration money), justifiably said the town uniquely blended Lao and French colonial influences. But its friendly, relaxed atmosphere and warm people are uniquely its own and they make it easy to simply enjoy the legacy of the past without reflecting on the horrors that the people have seen: from the US bombing campaign to civil war and the imprisonment and deaths of the king, queen and the last prince less than two decades ago. We left Luang Prabang in a clapped-out coach on the notorious Route 13. The coach was better than the people-carrying truck that was the alternative and it carried a mechanic because everyone, including us, expected it to break down. It did. Twice. The second time, the transmission fell out and the crew worked heroically as nightfall approached. They say Highway 13 is safe now that the army has moved in but until a few years ago, Hmong guerrillas were carrying out raids with automatic weapons. We saw no soldiers and heard, while waiting for the bus to be fixed, only the hauntingly beautiful sound of a woman's singing as she worked in the wilderness of the high hills. Vang Vieng, two-thirds of the way to Vientiane, must be among the world's most beautiful places. But not when we arrived at midnight with everywhere closed and the streets black. We managed to knock up a family with rooms to let and we slept: room, bed, shower, kindly concern  £1.80. The next day, we said farewell and moved to the only hotel. The town, which feels more like a village, is built in the sweep of the Nam Song river, with endlessly enticing views towards the horizon of limestone crags and hills. Those hills offer a dozen interesting caves and caverns  we opted for a distant cave and hired a motorised oxcart. A point at my flip-flops and a universal "OK?" brought a warm affirmative from the driver before we set off. Later, I realised that it wasn't that he didn't understand me: it was just that he thought it was quite OK to climb 650ft up boulders, some sections almost vertical, in flip-flops. But the effort was well rewarded: the small entrance led into a black, boulder-strewn natural tunnel ... and a great cavern where, in a pale light from a higher opening, a reclining Buddha glinted. The bus down to Vientiane was crowded. But it did not prepare us for the maelstrom of the city. The bus station was a seething mass of people and vehicles. And the city roads, in the rush-hour, were just the same. Eventually, in yet another jumbo, we arrived in the green haven of Villa Manopy guesthouse, with its antiques, quiet service and UN residents. The city centre was dusty enough to make breathing difficult and it had none of the easygoing friendliness of Luang Prabang. But, beyond the centre's scrum, there was the charm of gentle places and gentle people. Pha That Luang the Great Stupa  is where Buddhism and the state fuse, the former legitimising the latter and the whole becoming the symbol of nationhood. Its golden form encodes Buddhist doctrine from statues at ground level to the central spire, a stylised lotus bud symbolising the growth of the person from the mud of ignorance to the sunshine of enlightenment. We climbed the steps into the monument and later sat in the serene, walled grounds for several hours. A monk walked by and smiled; a family were harassed round by a tour guide; a young couple idled away half an hour. But we saw no one else at this, the country's premier monument. It was like that where ever we went: a scant few people walked round Xieng Khuan  better known in English as Buddha park  with its dozens of concrete sculptures from Buddhism and Hinduism, one more than 50ft tall. And at Sok Pa Luang, the forest wat famous for herbal saunas, we were the only falangs. The people at Wat Simuang, the busiest temple in the city, welcomed us during their day of making merit by taking gifts of flowers, incense, candles and fruit. June made merit by releasing two tiny birds from a cage and a young novice, Boun Thone Siamphone, gave us bananas and cut coconuts so we could drink the milk. Simuang is the temple where people go to make wishes. If their wishes are granted, they must return with gifts of fruit. When we return, we shall take bananas and coconuts to Wat Simuang The wish fulfilled and the gift delivered at the same time. John Keeble, who wrote this article, is a national newspaper journalist who has travelled extensively in South East Asia during the past 25 years. Your comments and articles about Laos would be welcomed. We can make special arrangements for receiving photographs. No payment is made for any contribution and publication is at the Editor's discretion.